Which Juicing machine is best? Side-by-side comparisons to help you choose. Which Juicing Machine is Best? On this page I compare three of the most popular juicing machines on the market, giving you the information to help you decide which is the best juicing machine for you. Once you've decided on a machine, just make sure to try and juice vegetables and fruits packed full of needed trace minerals. For the best quality juice, I encourage you to juice items produced through your own nutrient rich vegetable garden. When you grow your own vegetables and fruits, they will always be fresh, and can cost very little. They can also be highly nutritious when grown with sea minerals, and be very healing as well. 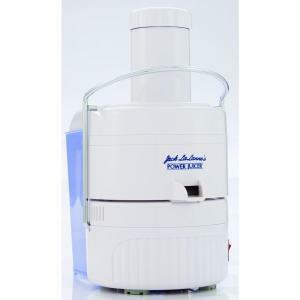 The Jack LaLanne Juicer and others like it juice incredibly fast, plus they are the least expensive. The cheaper ones can cost from $40 to $100. Many people purchase one of these as their first juicer. However, these machines inexpensive centrifugal juicing machines have some serious drawbacks, and I personally wouldn't own one. First, they operate at a high 3,600 rpm, and they tend to oxidize the juice, plus they are NOISY. Second, compared to other juicers, they leave more juice in the pulp. With other juicers you just run the pulp through a second time, but this is very inconvenient and time consuming with a centrifugal juicer. Third, when I used my parent's centrifugal juicer during our last visit there, I found it to be a royal a pain to clean up. With centrifugal juicers there are a lot of parts to clean, plus they tend to have a lot of nooks and crannys where bits of food can hide, making cleaning difficult. Food that doesn't get cleaned out can rot, and can expose you to dangerous bacteria. After doing tons of research, I purchased a used Champion Juicer for $100 on eBay. True to all I had heard, this juicer, which retails for $265, was extremely well built, and made to last a lifetime. The Champion Juicer turns at 1,725 rpm, which is less than half the speed of the Jack LaLanne centrifugal Power Juicer, and it isn't as noisy. This slower speed is one of the reasons why the Champion Juicer doesn't oxidize the juice as much as centrifugal juicers. The first stage of the Champion juicing machine uses an auger with rows of teeth to tear produce to shreads, then the second stage squeezes out the juice. The Champion Juicer also juiced fairly quickly. It did a wonderful job juicing fruit and juicy vegetables, and cleaned up in a quick 5 minutes. Although on juicier items it didn't get the pulp dry the first time, I could catch the pulp in my left hand and put it back through the machine as many times as I needed, till the pulp was dry. 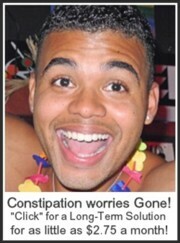 What were the drawbacks? It didn’t do as well at juicing harder items like carrots and beets. If I wasn’t careful, these would jam up in the machine, and I had to take a couple of minutes to take the machine apart and clean it out. However, by being diligent to intersperse softer items with the harder items, most of the time I was able to keep the pulp moving through ok. To juice stringy items like celery, it was necessary to break them into 2” lengths to keep the strings from wrapping around the auger, as this can slow down juicing speed considerably. The Champion juicing machine doesn’t juice wheatgrass juice or other leafy greens, which is a real drawback, as green juice is so very healthy for you. However, Champion does have a Greens Attachment that you can purchase for $74.95 that can be used to juice these. After a month of juicing and a lot more research, I sold my Champion juicing machine and purchased a used Omega 8004 on Amazon.com for $170. 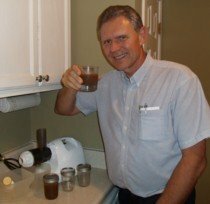 On their websites, both Dr. Mercola and The Juice Lady, Cherie Calbom, recommend the Omega 8005 masticating juicer (the Omega 8004 and 8006 juicers are the same juicer as the 8005, but with an upgraded auger). The Omega 8004 retails for $259, and is worth every penny. 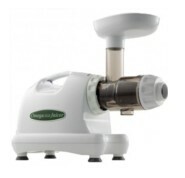 The Omega 8004 juicing machine turns at an amazingly low 80 rpm. It is quiet, and yet still I found it to be as fast as the Champion, just in another way. Since it doesn’t have the problem of the pulp jamming in the machine, you can continuously feed produce without slowing down. It does a great job juicing greens. In order to juice harder items like carrots or beets, it is best to take a few extra seconds to trim them down to about 1/2 inch in diameter. If you do that, they feed through the machine quickly. Stringy items like celery are no problem, since this juicer “bites off” about 1/2” at a time, breaking the strings, as opposed to the Champion juicer, which has a constant chewing action that doesn't break the strings. No juicer does it all. The Omega 8004 doesn’t do well juicing only soft items like fruits, tomatoes, cucumbers, etc. If you don't juice other items with them, the juice tends to back up in the juicer. If you are buying a juicer to juice mainly fruit, get a Champion. However, when juicing vegetables, I always have other items to put through to push out the juice from tomatoes, cucumbers and fruit. When I juice with the Omega 8004, I start with fruits, tomatoes and cucumbers, then juice intermediate items like leafy greens and celery, then do beets and carrots last. This order works quite well. I love the Omega 8004 Juicing Machine. Because the Omega 8004 turns so slowly, it doesn’t oxidize the juice as much. When purchased new, it comes with a 15 year warranty. The Omega 8004 is a truly versatile machine. An amazing feature of this juicer is the cleanup time. I can literally clean the Omega 8004 in 2 minutes. When using a centrifugal juicer like the Jack LaLanne, it is best to drink the juice right away. With the Champion juicing machine, the juice will keep up to 24 hours in the refrigerator. Fill it up to the brim in an airtight container to keep it from oxidizing. The juice from the Omega 8004 can last up to 3 days in the refrigerator, if sealed in an airtight container. 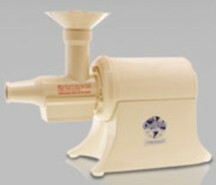 Here is a good website that compares the leading masticating juicers. I hope that this information has helped you in deciding on which juicing machine to buy. Whichever one you choose, I wish you Happy Juicing!